A staff meeting is generally called to order when an appraisal of the tasks implemented need to be reviewed or a future plan of action needs to be initiated. Among the various issues that are generally discussed, it is very easy to lose track and direction in such meetings without a proper agenda. Thus, with our sample staff School Meeting Agenda, the meetings are much more streamlined with provisions made separately for a call to order section to enlist the items on the agendas sequentially. Furthermore, these templates help divide a vast group into two sections to achieve administrative efficiency. 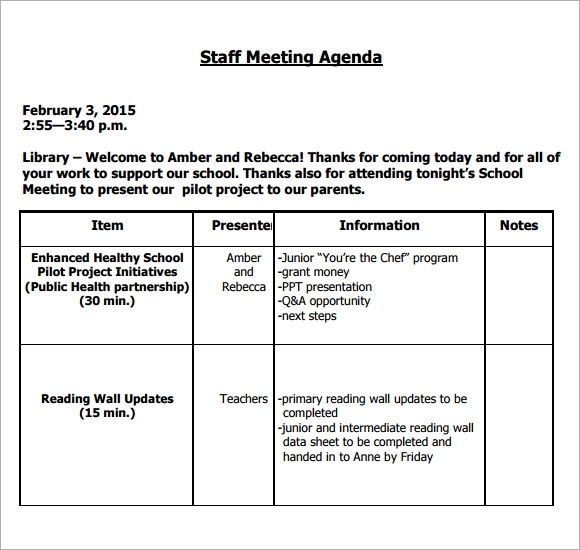 The staff meeting agenda sample template comes in word doc file format and can be downloaded easily. It can also be straight away printed and used. It can be used for weekly staff meeting agenda. 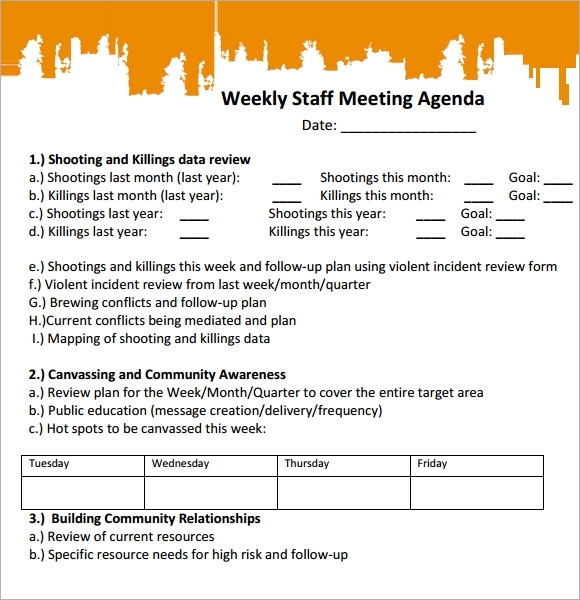 The template features all the details required for the staff meeting in the form of headings like shootings and killings data review, canvassing and community awareness and building community relationships. All these have subheads present for more detailing. 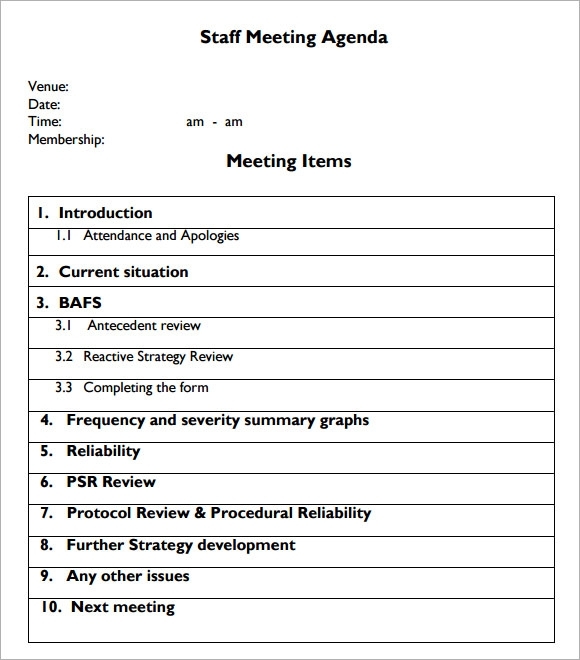 The staff meeting agenda format template comes in PDF file format and can be converted to word doc file format easily. It has designated spaces for the details like venue, time, date and membership. The template organizes meeting items clearly by categorizing them in details like introduction, current situation, BAFS, Reliability, PSR review, next meeting and more. 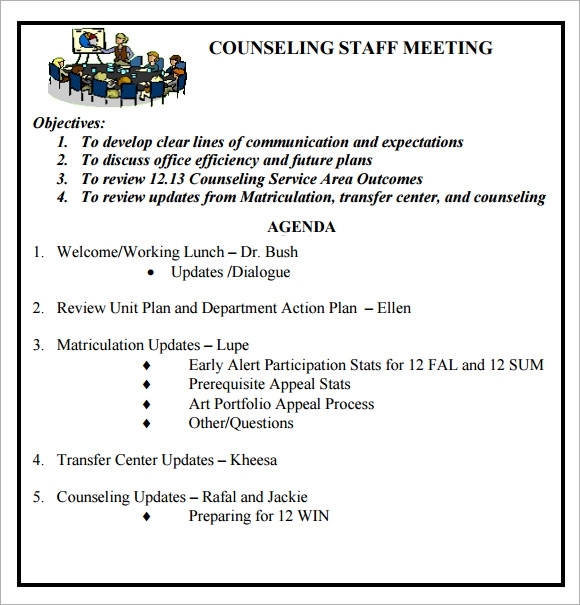 The staff meeting agenda example template can easily be downloaded from internet. It highlights the title, issue date, last reviewed and next review date. Along with this, this template also features details like location, attendees, distribution, apologies, agenda and agenda items specifically. The template can be modified according to different needs. The sample staff meeting agenda template comes in word doc file format and can be edited according to needs. The template has designated spaces for information like date, time, location, invitees, present and absent invitees. It also has columns for time, action and outcome. Along with this, the template also features review accomplishments, identify topics for next meeting, identify improvements to meeting process and adjourn to provide other left out information. 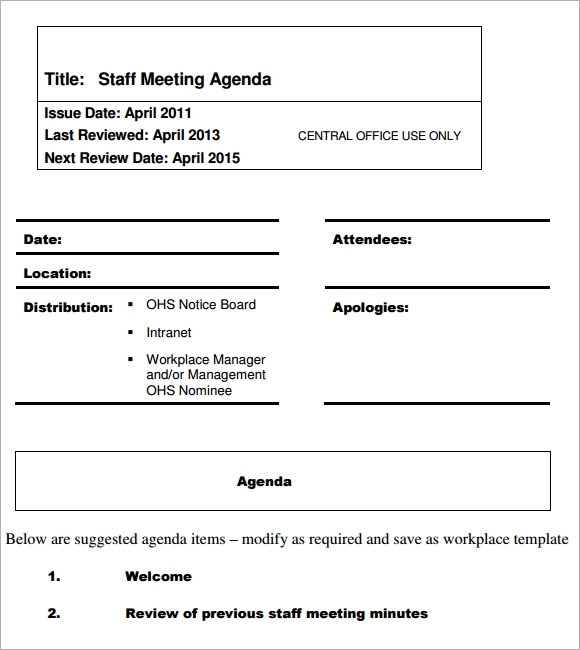 Why Does a Company Need a Staff Meeting Agenda Template? An agenda is needed for the staff meeting to stay focused and frame proper conclusion. The staff meeting agenda template does that. It provides all the details required for the meeting to be successful like current situation, further strategy development, review of unit plan and department action plan. The template helps create the effective staff meeting agenda with ease and with so less time. These templates are fully editable and can be modified according to the needs. Also, there are many options to choose from keeping in mind the requirements of staff meeting. When Does A Company Need Staff Meeting Agenda Template? The staff meeting agenda templates have multiple benefits like it saves time, it gives out exactly what is needed, helps you stay focused, helps in maintaining records, provides the effective outcome. All the templates are available on the internet and can easily be downloaded. These templates along with featuring all the information, also presents them in order. They can also be edited if there’s a need to add or delete any detail. So, by using these templates a company can get all these benefits without much effort. When there is a staff meeting, it’s better to have all the facts and a fixed agenda in prior. The staff meeting agenda template provides you with that within no time. It provides you all the details and also can be edited if there is a need of furthermore detailing.